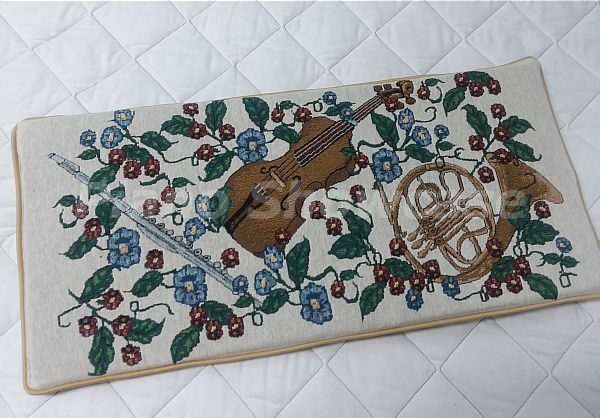 Our Violin & French Horn cushion has lovely soft flowers in the background and is completely reversible. Three sets of sewn-in ties that tie under the lid to hold the cushion in place. Standard cushions are 1" thick. The 2" thick booster cushion costs only $12.00 more. Colors for the back side listed below. Available in Size 14" x 30"
Backing colors- Acrylic polyester velour fabric. Click here for a larger image of color choices. DISCLAIMER: We try to edit our photos to show the color samples as life-like as possible, but please understand the actual color may vary slightly, depending on your specific monitor, the settings and your lighting conditions. The cushion colors depicted should only be used as an approximate guide. We cannot guarantee that the color you see accurately portrays the true color of the product. Standard return policy applies. View return policy here. 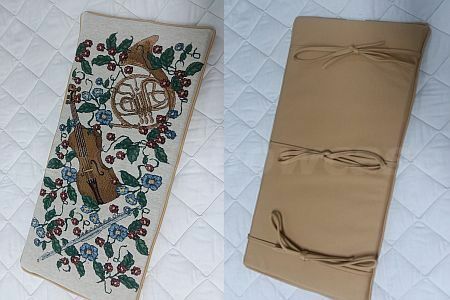 I received an e-mail telling me the color of fabric I had chosen for the backing of my piano bench cushion would not look good with the violin-horn design. I wrote back asking about another color of fabric and was told that would be a good choice. They changed my order and my cushion is beautiful. Thank you for wanting your product to be the best it can be. I love my new piano bench cover! It matches my room perfectly and is nice and comfortable to use. The only small problem I have with it is that the green color I chose is not really what I expected....it is sage and is not the same as the green in the floral design. Still, it is very pretty and works for me. Thank you for the marvelous piano bench cushions! They are very high quality, and we are thrilled with the workmanship and service of your product! Keep up the good work! It is companies like you that make America great! God bless you all!!! 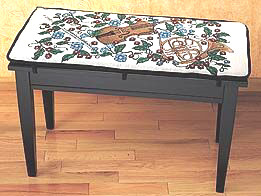 So glad I chose this co. to purchase a piano bench cover for my mother's piano. She LOVES it! Paid the extra for more padding, but it wasn't much more, & totally worth it. Would absolutely use this co. again.